Phantoms' players celebrate after booking their place in the play-off finals. Photo: Alan Storer. Peterborough Phantoms’ best season in years just continues to get better. Dismissed by many as being an early-season flash in the pan and written-off by plenty of others as over-achievers, Phantoms are now two games from English Premier League play-offs trophy glory. Slava Koulikov’s magnificent men booked their place in the finals for the first time in four seasons after leading from the opening minute until the final buzzer of their quarter-final triumph over Swindon at the weekend. A 4-3 road success in Wiltshire on Saturday (March 28) was followed by a 2-1 success on home ice last night (March 29) to complete a 6-4 aggregate triumph. The crucial goal arrived with just under nine of the 120 minutes still to play as Marc Levers danced deep into Wildcats territory before guiding a sublime pass perfectly onto the stick of Edgars Bebris, who smashed the puck past Swindon netminder Stevie Lyle. Phantoms’ reward is a semi-final clash against double-winners Telford on Saturday (April 4) lunchtime. Manchester and Milton Keynes will contest the other last-four clash after shocking higher-ranked sides Basingstoke and Guildford respectively at the quarter-final stage. 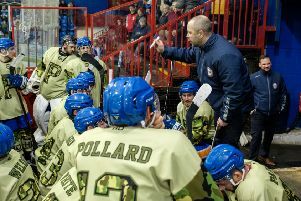 “It was a very tough six periods over the last two nights,” admitted Koulikov, who has reached the play-off finals for the first time in his short coaching career. “There were plenty of ups and downs, and changes of momentum along the way, but all that matters is that we came out on top. “The first and last periods of the weekend were our best and they were probably crucial. When we got the second goal on the night I knew in my head that we were going to make it. “I felt in the second half of the second game that my guys wanted it more and that is another big reason in why we won. “They did a fine job to close the game out and I can’t give them enough credit for the way they have performed – not just this weekend but throughout a long season. “We have earned the right to go to Coventry and it doesn’t matter to me who we play. To be the best you have to beat the best and that is what we will need to do. Phantoms returned to home ice in the driving seat after a 4-3 Saturday success in Swindon and they quickly extended that advantage. Luke Ferrara made the breakthrough on the night when pouncing on a rebound after Wildcats netminder Stevie Lyle had spectacularly kept out Donatas Kumeliauskas during a powerplay. But Swindon responded little more than seven minutes later on a numerical advantage of their own as Jonas Hoog bagged his second goal of the weekend. Chances were at a premium in a nail-biting, nerve-jangling second session with both teams appearing fearful of making the mistake that might end their hopes of advancing to the finals. But it was much more open in the final session as Swindon’s need for a goal forced them onto the attack while Phantoms had plenty of joy on the break. Lyle denied Darius Pliskauskas and Kumeliauskas before being powerless to prevent the city men from sealing their passage to Coventry as Bebris provided the finish that Levers’ terrific work deserved. Swindon lacked imagination and ideas as they offered little in response and they were a beaten team when import wild man Tomas Kana was ejected in the closing stages. The Czech bruiser, who had earlier sat out a 2+10 spell in the second period for an ugly check to the head on countryman Milan Baranyk, lost his cool with the officials after being called for holding. With his angry stomp back to the visiting locker room went the Wildcats’ hopes of salvaging the situation as Phantoms stood strong to finish the job. Other play-off quarter-final results: Telford beat Sheffield 11-3 on aggregate; Milton Keynes beat Guildford 7-5 on aggregate; Manchester beat Basingstoke 8-7 on aggregate.